However there was a teacher, Li Laoshi, that was different. Maybe because she was the only one – to be fair I also had another teacher good with that – able to explain to this stupid laowai how Chinese phrasal structure works (I don’t wanna use the word “grammar” as, I’m sure, someone will try to convince me Mandarin has no grammar). I still recall when Egor – one of my classmates – asked for an example on how to use the particle 被 (bèi), which is needed to create the passive form. She could have used a standard sentence as “The book is read by the student”. I was fascinated. It always seemed to be in a book of James Ellroy or a movie of Quentin Tarantino. What a shame she left after a week (for some obscure reasons our teachers were always rotating). Another aspect I liked about Li Laoshi was her way to explain everything through storytelling. Today I want to tell you one of her stories. There is this American guy, let’s call him Frank, that speaks very good Chinese. His grammar is correct, (I know I know Chinese has no grammar but anyway…), he gets the tones right, he actually understands when a zhongguo ren talks to him and so on… let’s say he’s fluent in Mandarin. Yet, there are some Chinese people, mostly the ones that seldom talk with a laowai, that still don’t get what he says (I know this situation very well has nobody seems to understand me but anyway…). Finally, I asked to Li Laoshi if she was still teaching Chinese and how students could reach her. She answered to me she’s moving to Europe soon and the school she founded will merge with Shanghai Monkey King Chinese school. 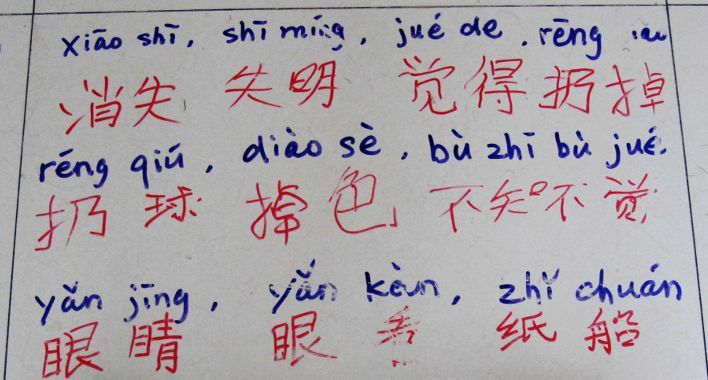 There we go, if you are new to this blog and you want to know how I’m trying to learn Chinese, check this post. I did my Anki’s cards every day but from one side I was not able to complete the third deck (I only studied 800 cards within 1491…) because I stumbled upon too many obscure characters (to me at least) that forced me to slow down in order to keep my study within one hour per day (and I’m not going to study more as I know that in the long term this would become difficult to handle leading to a loss of motivation for Chinese learning). Also, I was not able to advance too much on my Chinese course this month because I used to study at night but I don’t have Internet at home anymore (yeah… welcome to China). I could have downloaded the material and so on but I’m simply too lazy for that. I plan to catch up with the course this month and, since I’m going to finish it soon, I need to find a new one. I did keep listening 100% of Chinese music on my iPod – mostly 二手玫瑰 (Ershou Meigui or, in English, Second Hand Roses), thank you Fulan for the tip – and watching one Chinese movie per week, which is pretty good. I would like to try out some podcasts – probably Chinesepod as I really like how John Pasden explains Chinese on his blog, Sinosplice – so that I can actually study on my way to work or wherever I’m going (the course I’m doing now it’s built in a more traditional so it’s difficult to check it while I’m walking). Another reason I want to introduce podcasts into my routine is that I feel my motivation is dangerously slipping away (keep in mind my attention span is about five seconds so this shouldn’t surprise you at all). Since it’s difficult to evaluate my progresses (nope, I cannot understand a movie yet, both dialogues and Chinese subtitles are still too fast for me…), I decided to repeat Chineselevel’s test every month: this month I scored 70% (last month I only did 58% so that this tremendous improvement makes me wonder whether the fact I repeated the same test biased the results or not, even if last time I didn’t do any effort to remember the words I didn’t know).